Today my friend Rosie and I attended a small reenactment at Fort Roberdeau in Altoona, PA. We're just getting started in Revolutionary War Reenacting with the German Regiment of the Continental Line. Rosie borrowed her outfit from Allison Lavens. Allison is a wealth of knowledge on clothing of the 18th century, especially the clothing of a camp follower. 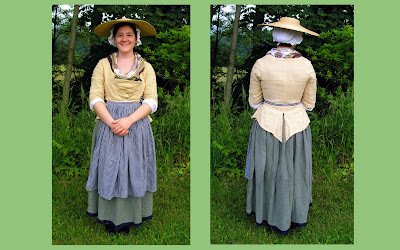 You can listen to a presentation by Allison on 18th Century Clothing HERE. My Costume was started and completed the night before the event. I had another outfit, but this fabric was dying to be made up into a cute little jacket, so I gave in! 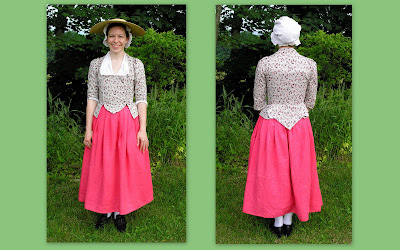 The skirt is made of pink linen - a vintage tablecloth! The jacket is based off of a jacket in the Colonial Williamsburg Collection featured in the book 'Costume Close-Up'. The jacket is made of a reproduction print cotton. 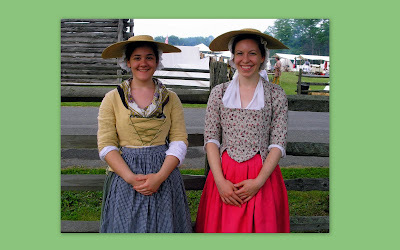 The Straw Hat is from Colonial Williamsburg, but similar hats can be found at www.SillySisters.com. The Shoes are from Fugawee. And, to add a little excitement to your 18th Century Clothing Research...Here are two links definitely worth checking out! Oh, I am so jealous!!! :) I have been dying to get into Rev. War reenacting but my husband won't hear of it right now. He is head over heels in the 1860's. I love your outfit and too am amazed you made it the night before! The fit is excellent! I can't wait to make some 18th century clothing but must make some proper stays first. Thanks for the links!